Hupy and Abraham, S.C. Attends Hot Bike Tour | Hupy and Abraham, S.C. Hot Bike Magazine has been around since 1971, providing technical articles and fabulous photographs of custom motorcycle designs. Because custom bikes should be functional as well as artistic, the editors, Jeff Hall and Corey Eastman created a builder competition around a 1,000 mile tour. 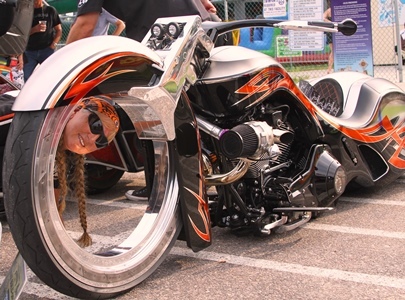 Despite some critics of modern day custom bikes who think they are only for looking at, the folks at Hot Bike proved that they are more than road worthy by including the five day tour in the competition. This year's tour invited 24 of the nation's top builders in two categories, Hot Bike and Bagger, including Dave Covington of Covington Customs, John Shope, Dirty Bird Concepts, Chris Eder, Misfit Industries, Paul Yaffe, Bagger Nation, Brian Klock, Klockwerks, Nick Trask, Trask Performance, Len Edmondson, Azzkiker Custom Cycles, and Zach Ness, Arlen Ness Enterprises. The Hupy and Abraham, S.C. video street team was there to capture some of the action and conduct some interviews which will be posted on the firms web page soon. The tour started in Joplin, Missouri on August 16, traveling the next four days to Jefferson City, Missouri, Springfield, Illinois, Bettendorf, Iowa and ending at Chula Vista Resort at Wisconsin Dells, Wisconsin. That's where we caught up with the riders who spent five total days on the road covering over 1,000 miles. There was mostly good weather, although they did ride through some torrential rain, and a few riders experienced some mechanical problems, but they all made it to the final stop. 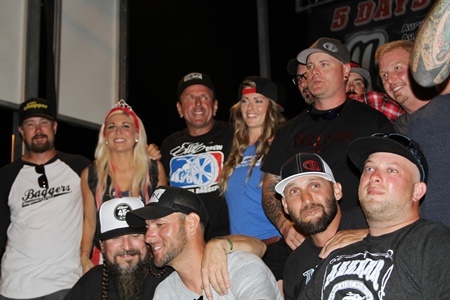 Each night of the tour, the pro-builders went head to head in a people's choice competition as well as local riders displaying their rides for everyone to enjoy. On the final night in Wisconsin, the nightly winners were announced as well as the overall winners for the two categories. 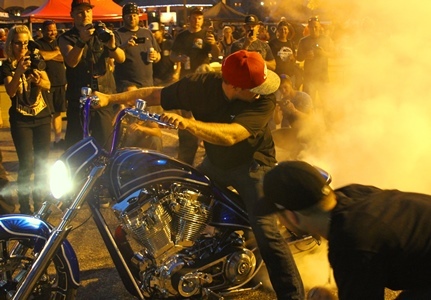 Taking home the trophy in the Baggers class, a ring and free trip to Verona, Italy to compete there in January, 2015 was none other than John Shope of Dirty Bird Concepts. A real surprise and crowd pleaser was the winner of the Hot Bike category, Mike "Majik Mike" Rabideau. He was overwhelmed when his named was called out. Mike is a local boy from Racine, Wisconsin, and unlike the professional builders who build bikes for a living, Mike is a garage builder, creating unique customs in his spare time, although after winning this and being invited to Verona, he may be quitting his day job. It was a great competition with the best of the best in attendance and everyone is looking forward to hearing where the tour will be going to in 2015.